Duchenne muscular dystrophy (DMD) is a severe type of muscular dystrophy. The symptom of muscle weakness usually begin around the age of four in boys and worsens quickly.Typically muscle loss occurs first in the upper legs and pelvis followed by those of the upper arms. This can result in trouble standing up. Most are unable to walk by the age of 12. Affected muscles may look larger due to increased fat content. Scoliosis is also common. Some may have intellectual disability. Females with a single copy of the defective gene may show mild symptoms. The disorder is X-linked recessive. 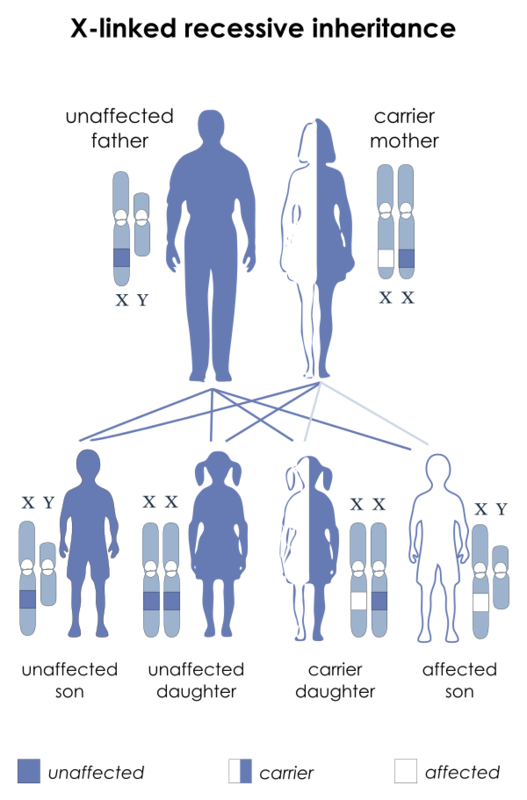 About two thirds of cases are inherited from a person’s parents, while one third of cases are due to a new mutation. It is caused by a mutation in the gene for the protein dystrophin. Dystrophin is important to maintain the muscle fiber’s cell membrane. Genetic testing can often make the diagnosis at birth. Those affected also have a high level of creatine kinase in their blood. The disorder is X-linked recessive. About two thirds of cases are inherited from a person’s parents, while one third of cases are due to a new mutation. It is caused by a mutation in the gene for the protein dystrophin. Dystrophin is important to maintain the muscle fiber’s cell membrane. Genetic testing can often make the diagnosis at birth. Those affected also have a high level of creatine kinase in their blood. No cure for muscular dystrophy is known. PhysicalPhysicalPhysical therapy, braces, and corrective surgery may help with some symptoms. Assisted ventilation may be required in those with weakness of breathing muscles. Medications used include steroids to slow muscle degeneration, anticonvulsants to control seizures and some muscle activity, and immunosuppressants to delay damage to dying muscle cells. DMD affects about one in 5,000 males at birth. It is the most common type of muscular dystrophy. The average life expectancy is 26; however, with excellent care, some may live into their 30s or 40s. Gene therapy, as a treatment, is in the early stages of study in humans.